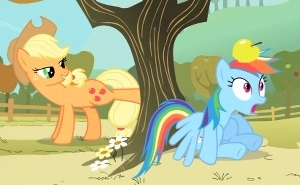 Episode 13: "Fall Weather Friends"
Intro: Applejack beats Rainbow Dash throwing horseshoes. Act 1: AJ and Dash compete in an Iron Pony competition. The two are evenly matched until Dash begins using her wings, with which she wins easily. Act 2: AJ and Dash join the Running of the Leaves, surprised that Twilight Sparkle will also be racing, having only read about the sport. 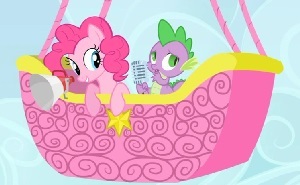 Pinkie Pie and Spike provide commentary. AJ and Dash both stumble and each accuses the other of cheating. Act 3: AJ and Dash focus entirely on slowing each other down. Two strategically used branches, a hornet's nest, a spun road sign, a trail of syrup, and one rock slide later, they end up tied for last place, while Twilight trots in at fifth place. 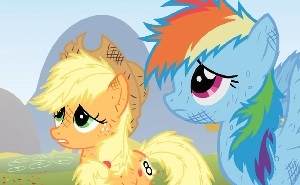 Upon seeing Princess Celestia at the finish line, Applejack and Rainbow apologize for their behavior. Character: Rainbow Dash and Twilight Sparkle are exactly in character here, and both Pinkie and Spike are well placed as color commentators. In fact, Spike becomes the series' go-to for narration and announcing from here on out. I enjoyed seeing this side of Twilight, because while she often doesn't handle pressure well, she's not competitive. She's concerned about failing to live up to her own standards and others' moral expectations, but she's totally uninterested in showing anypony up. This was demonstrated to a fault in Boast Busters, but here it's a more positive presentation as she's actually respecting the tradition and purpose of the event. Actually, her attitude toward the event and her contentment with how she finished is how most runners I've known approach a marathon or a similar run open to the public. Again we see Applejack's errors arising from her strengths, in this case her honesty. Her competitive spirit goes all the way back to Ticket Master (hoof-wrestling Rainbow Dash for the ticket), and both ponies are well versed in contests of various sorts. However, AJ is sportsmanlike at the outset. She only gets fired up because of Rainbow's cheating, both actual and assumed. The situation and its outcome are totally believable as far as personality and character are concerned. Nevertheless, Lauren Faust has indicated the writers were treading a very fine line standards-wise in giving the two competitors the "bad attitudes" they have in this episode. There is one out-of-character moment when Applejack laughs at Twilight; I just don't see her doing that. It's an odd slip since AKR is usually the best writer for Applejack. Although she's only in the background here, Fluttershy gets some nice reaction shots during the Iron Pony competition. Lesson: The competition is placing a short-term strain on AJ and RD's friendship as they treat each other as adversaries for the bulk of the episode. But because there's so much action taking place, we're not subjected to the bickering of Look Before You Sleep. This is a fun way of presenting the priority of friendship over petty concerns and differences, including differences of ability. When you think about, it's tempting to compare and compete with one's peers in just about all aspects of growing up, so this is a good point to make. The greater focus of the episode actually seems to be the myopia that results from giving a game too much importance. The two are so focused on beating each other, they fail to notice others pass and end up in last place. But as Princess Celestia points out, they (and perhaps most of the other racers) have failed to bring down the leaves, which is the practical point of the entire exercise. Children play games all the time, and teachers often use games in order to teach, and so this too is a relevant lesson. Logic: AJ and RD missed the purpose of the race, but I didn't see Twilight's slow-and-steady pacing shaking down many leaves, either. Perhaps we should've seen her bucking some trees as she trotted along? Connections: Along with Winter Wrap-Up, Sonic Rainboom, and next season's Hurricane Fluttershy, this episode reinforces the idea that the forces of nature in Equestria are controlled by ponies and don't operate on their own. It's in the Ponyville spirit to use this occasion to bring the town together in harmony and cooperation, which speaks well of a town that sometimes has trouble hanging together. Resonance: A number of the gags here are more conventional or cartoony than we've come to expect and are probably intended as shout-outs to classic Looney Tunes. I'm all for nostalgia, but it felt a little out of place here. Pinkie's color commentary (particularly her digression about fudge) provides a few laughs, and I chuckled at Twilight unabashedly (even proudly) stating that she prepared for the race by reading about racing. The episode could have used more truly impressive feats, but Applejack's power with the high striker was pretty awesome. Other Impressions and Final Assessment: This obviously takes place before Winter Wrap Up. A brief January hiatus put this episode's original airing more than a month after WWU, so the reversal of seasons wasn't as jarring as it might appear on an episode guide. I like the fact that Twilight finished in fifth place. Most shows would have had her finish first, and we'll notice as the series goes on that the writers seem determined to avoid first-place victories and clichéd come-from-behind wins. "Winning isn't everything" could even be understood as a recurring motif on this show. The tying of Rainbow Dash's wings for the race echoes a G1 episode, but it may also be a shout-out to the flying donkey from the Disney film The Three Caballeros. 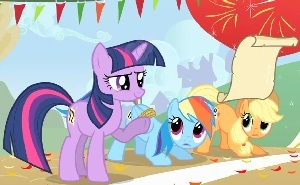 (Storyboard artist Sibsy has since stated more broadly that numerous Rainbow Dash poses are inspired by the donkey's cartoon short.) Princess Celestia's appearance at the end is a welcome surprise. We rarely see her out and about, and her presence adds a lot of weight to the embarrassment of Applejack and Rainbow's very public display. The unspoken message here is that you never know who might be watching. Aside from that, there's nothing really ground-breaking. The plot is simple and the lesson a fairly light one compared to Bridle Gossip, which has a similar level of quality. In series order, this is the first run-of-the-mill "ok" episode we get to. Still, no major problems; it's enjoyable and high-quality by first-season standards. Attention to detail is high as always (the starting bell, Fluttershy catching one of the roses, the ponies using their mouths and muzzles to throw horseshoes rather than somehow tossing them with their hooves, etc.). With a dramatic moment or two it might rise into the Iron tier. The fact that an episode this good is a relatively weak entry by MLP standards speaks well of the quality of the series.